SANTA ROSA, Calif. — The sergeant's night shift began unremarkably at 7 p.m. on Sunday, Oct. 8. But by midnight, as flames, smoke and wind roared across the parched hills of Northern California, it was clear that Brandon Cutting of the Sonoma County Sheriff's Office was in for an exhausting, treacherous night. By the end of it, Cutting had raced through fire, been pelted with embers and grabbed people from burning homes — all while avoiding downed trees and branches and working, for a time, without a radio. "I was scared beyond reason," he said, adding: "I don't know how we didn't catch fire." A week after a series of wildfires devastated large swaths of Sonoma, Napa and Mendocino counties, Cutting said he'd barely slowed down, even as thousands of other firefighters were finally beating back blazes that have killed 41 people and destroyed 5,700 homes and other structures, authorities said. In Sonoma County, 88 people were still missing and 40,000 others remained under evacuation orders, NBC Bay Area reported. The latest death occurred early Monday, when a water truck driver died in a single-vehicle crash in Napa County, said Bret Gouvea, an incident commander with the California Department of Forestry and Fire Protection, or Cal Fire. Still, Gouvea said he was "cautiously optimistic" about the firefighters' continued advance on the flames. "Our containment percentages are continuing to go up," he said. Cutting's first call on what would become known as the Tubbs Fire — a blaze that has burned through 36,000 acres and is 70 percent contained — came late that Sunday, when he was asked to help conduct evacuations near the Napa County line. Cutting was among four responding units. But as soon as he saw the fire, he knew that wasn't enough. "I saw it and said: 'Send a bunch more,'" he recalled. 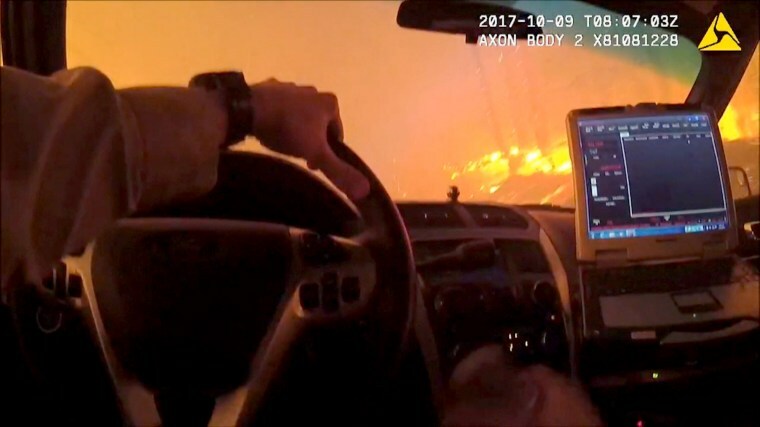 As one deputy raced to rescue someone trapped on a nearby road, Cutting tried to determine how far west the flames had moved. "As soon as I came around a corner, I was on a ridge, and the fire was coming down [the] street," he said. On top of a nearby hill, he could see a house he knew was already engulfed in flames. From there, Cutting started conducting door-to-door evacuations with 15 other deputies, sometimes as the fires were just beginning to tear through homes. At one point, Cutting's body camera captures him sprinting through a whirl of embers with his flashlight out as someone shouts for help. It's a patrol deputy trying to drag a disabled woman from a burning home. At another point, Cutting is behind the wheel, with a wall of fire to his right and shooting flames to his left. "Please don't hit me," he pleads. Cutting said he wasn't wearing protecting clothing, nor had he trained as a firefighter. "We never stood still long enough to let the situation kind of dwell on us," he said. "We were really lucky." Joe Fryer reported from Santa Rosa. Tim Stelloh reported from Alameda, California.